This wonderful organic cotton double duvet cover from Natural Collection is as simple and pure as it can be. Light and soft, with a subtle stripe and lovely sheen, this luxurious addition to our organic bedding range is suitable for even the most sensitive skins. Ecru cotton - manufactured with no chlorine or optical brighteners. 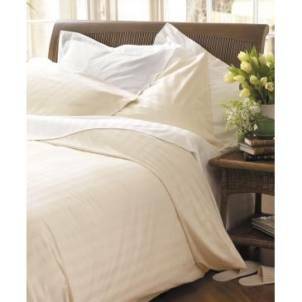 The Natural Collection Organic Cotton Double Duvet Cover - Ecru product ethics are indicated below. To learn more about these product ethics and to see related products, follow the links below. I've had the same product in king size and have been using for years. The cotton has a lovely soft, silky feel to it and it has worn really well. The natural colour is great too. There are currently no questions to display about Natural Collection Organic Cotton Double Duvet Cover - Ecru.